Ben (Josh Duhamel), an ambitious lawyer with a struggling marriage is sucked into a world of destruction when he takes on a case against the boss of a large pharmaceutical company, Dennings (Anthony Hopkins), lured by his ex Emily (Malin Akerman) and controlled by his boss Abrams (Al Pacino). 'Misconduct' is Shintaro Shimosawa's directorial debut, having worked on TV show 'Ringer' and 'The Grudge' and brings some of those themes and styles to the movie. Unfortunately, the film's choppy editing and inconsistent pace leaves you in confusion for much of the film. At first glance, it seems like it would be a typical 'Anthony Hopkins' thriller. Powerful man, something to hide, a game of manipulation, fear and deceit. It may seem that way, until 'Misconduct' throws in the layer of femme fatalism meets 'Gone Girl' whilst having protagonist Ben run around like Jason Bourne that just doesn't work. Despite its own confusion, there is an attempt at a stylish cinematography that should not go unnoticed, whilst also managing to conjure rare moments of tension and sensuality, just not enough, and not consistently enough. Undeveloped characters left the movie hollow and by the end of the film, the cluster of twists it tries to throw at you is ineffective, a classic case of too little too late. Also stars Alice Eve and Julia Stiles. 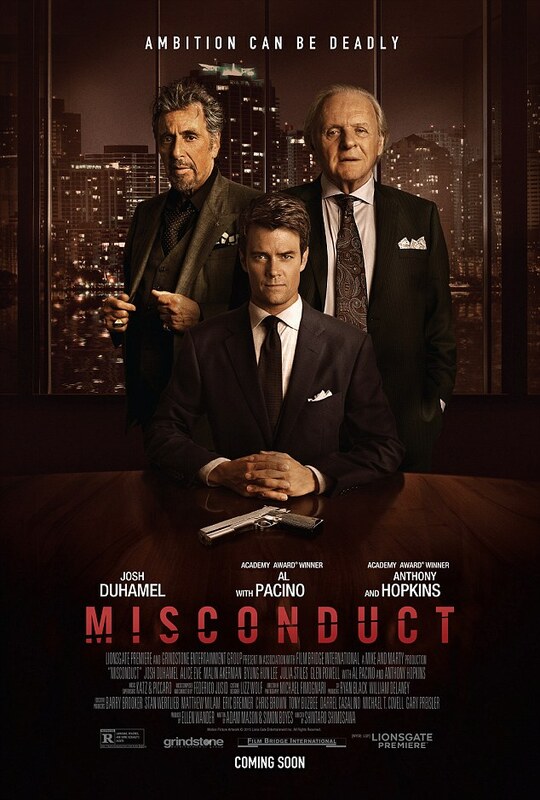 With whopping potential, Misconduct misfires into a genre-confused mess that tries too hard and too much, leaving little to be desired or enjoyed. The strong cast was unfortunately undeveloped and felt like they were simply name-dropped into the half-baked film. Nonetheless, there are rare moments of tension, sensuality, empathy and shock; just not coherently strung together. Whilst it may sound harsh, the film simply doesn't raise the bar, and what it serves is a somewhat enjoyable, lukewarm thriller that fills the gap between now and 'Jason Bourne'.